What’s better than a stack of fluffy buttermilk pancakes? 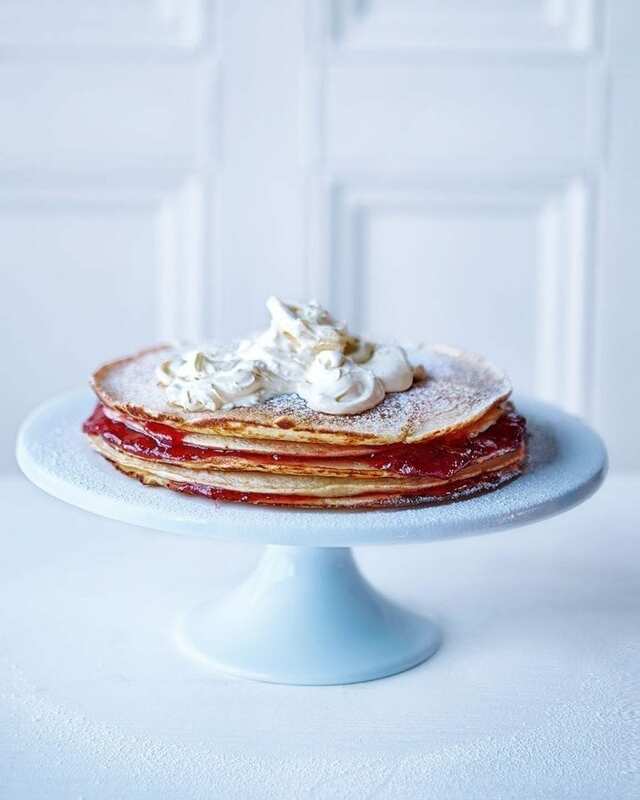 A giant stack of pancakes with your favourite jam and clotted cream, that’s what. Heat the oven to very low. Mix the flour, baking powder, cream of tartar, sugar and a large pinch of salt in a large bowl. Make a well in the centre, then add the egg yolks and vanilla bean paste and stir. Slowly pour in the buttermilk, stirring constantly, to form a smooth, thick batter. In a separate large, spotlessly clean bowl, whisk the egg whites using an electric mixer until they form soft, floppy peaks. Using a metal spoon or balloon whisk, gently fold the whites into the pancake batter, starting with a tablespoon, then adding the rest in 2 additions, for a light, fluffy batter. In a 20cm non-stick frying pan, melt a knob of butter over a medium heat. Once the butter is sizzling, ladle in a fifth of the pancake batter and gently spread out with the back of the ladle to coat the base of the pan. Turn down the heat to low and cook the pancake for 3½ minutes until the top is almost dry and the underside looks golden when raised. Using a palette knife or fish slice, flip the pancake over and add a small knob of butter to the pan, tipping it to distribute. Cook for 2-2½ minutes more, then remove to a baking tray, cover loosely with foil and keep warm in the oven. Repeat 4 times to make 5 pancakes. Pile up on a serving platter, adding 2 layers of jam (about 4 tbsp per layer), then dollop clotted cream on top. Dust with icing sugar, cut into wedges and serve.